At El Alamein Museum we saw a 3 ton truck that was exactly what my father and his fellow soldiers had made their home whilst in the desert. They would dig into the sand and drive their lorry in, covering themselves with a tarpaulin at night so as to be warm and not visible to the enemy. It was said with meaning that really the real enemy at this time was the desert. The soldiers would not always know where the enemy actually was. Although appearing flat, the desert is not at all, and has many ridges that can hide tanks and soldiers. Also, when Germans captured British vehicles they would sometimes use these in battles so it was not always possible to recognise the real enemy. Lunch this day consisted of tahini and cold chips, cheese rolls, cucumber and a tomato with an unusual fruit drink as accompaniment. This was taken in the middle of the desert, perched on an extremely uncomfortable rock in 40 degrees heat. But this couldn’t even begin to compare in discomfort to what my father and his generation must have borne. We didn’t complain. We were beginning at this stage to desire some different kind of fayre for our meals but bore this also with fortitude when my father explained that his daily diet was corned beef and hard taq biscuits that the soliders had to crush with water in order to make them edible. He also said that he only got one pint of water a day, and he recalls that sometimes he had to give some of this to the cook. 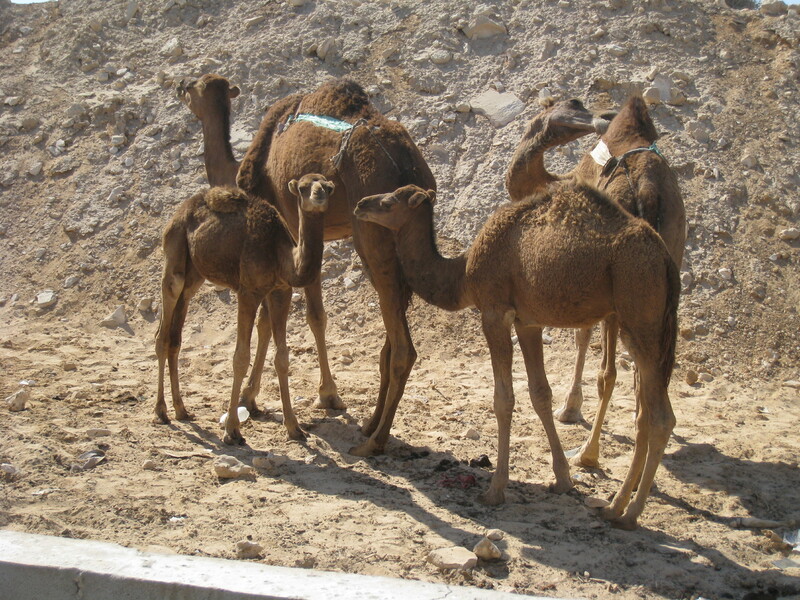 One sight we do hope to recall in our minds is that of a herd of camels wandering through the desert with their herder. Apparently a man’s wealth is measured by how many camels he has. It was lovely seeing them in their natural habitat as opposed to all dressed up for giving tourist rides. I was the only one to oversleep this morning. My 91 year old father, despite being one of the last to go to bed due to putting the world to rights in the bar the previous night, was up and breakfasted with everyone else and was wondering where I was. I blame my phone as the hour had gone back, realigned itself with Greenwich meantime which meant that so did my phone and Egypt was now GMT + 2. 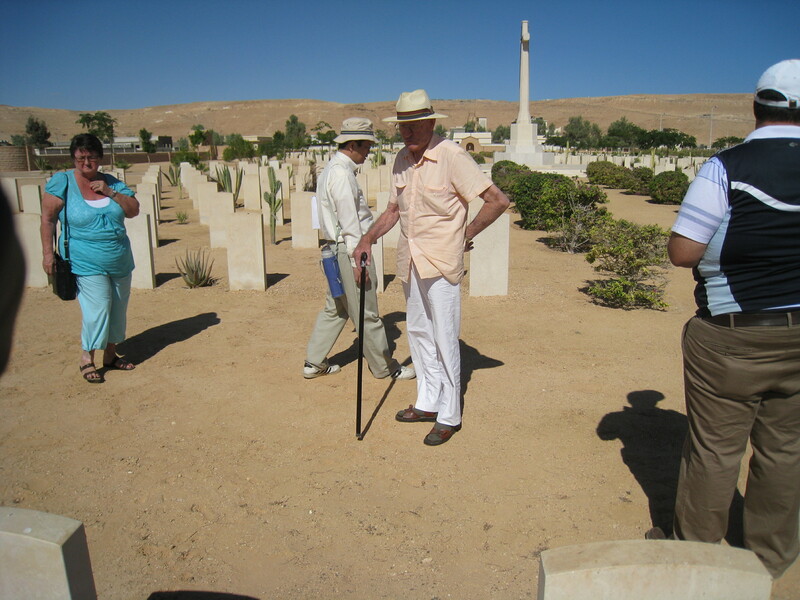 This was the day we visited the cemetery at El Alamein. A deeply powerful moment for my father as this is where he did serve in those terrible days. 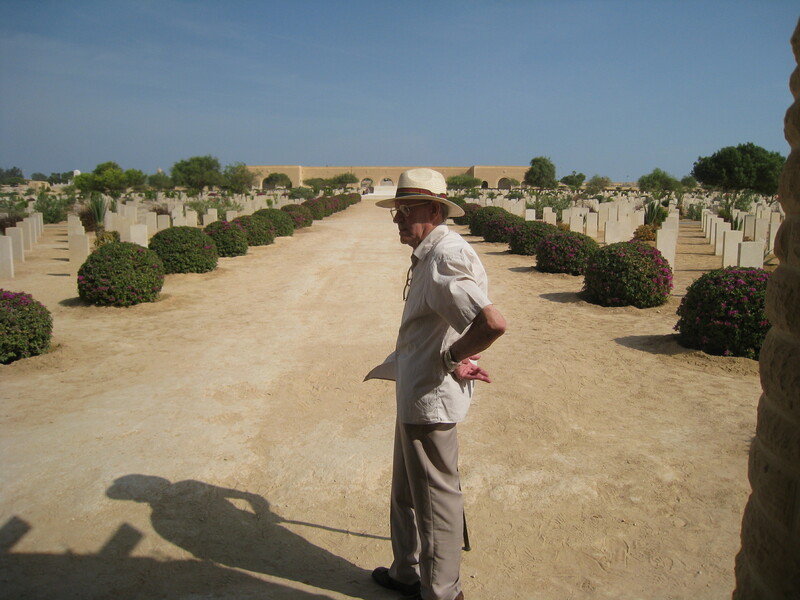 The poignant moments for all our group were different but no-one could not be affected by seeing several touching headstones – this is because these young men died together, and their remains cannot be separated, therefore they rest, as they died – together. 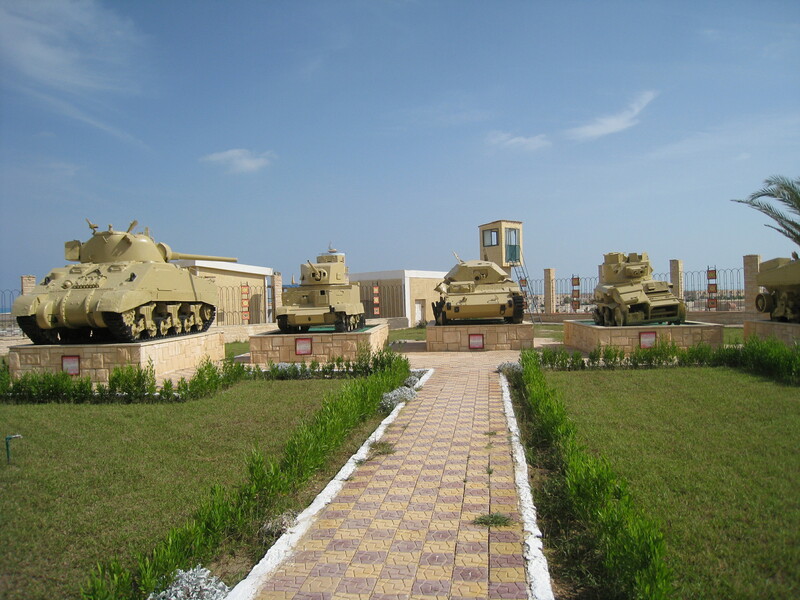 The El Alamein museum is nicely appointed. Not entirely 100% accurate according to our guide Steve Hamilton who really does know everything there is to know about this period of history. The museum also holds examples of all the different kinds of desert uniform; the Italians still managed to be the most stylish – even in war. We were told horrifying stories of POW ships and ships carrying the injured were sunk by friendly fire off the coast of North Africa. 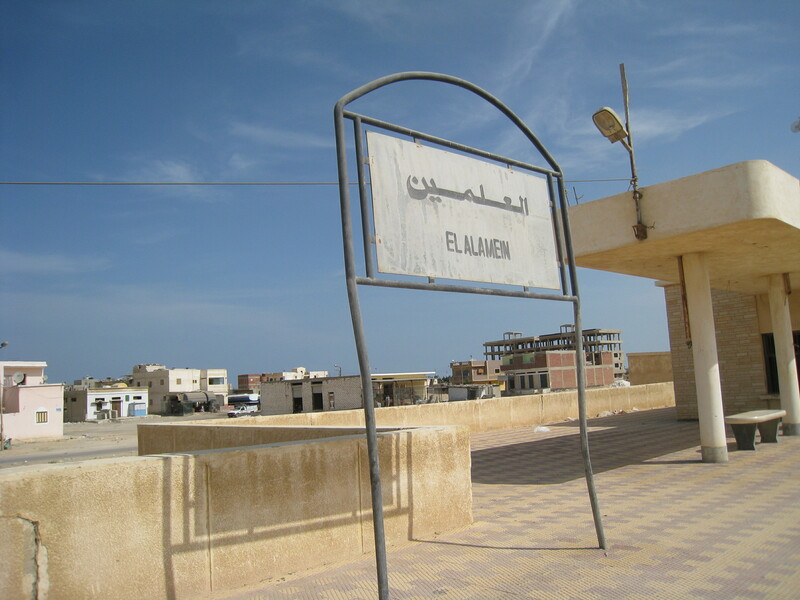 El Alamein train station itself is a wreck. What a pity as it could so easily be turned into a memorial. We then visited the actual sites of the battles themselves. There are still thousands of uncleared mines – so it is a bit risky wandering off the beaten track. There are still active mine sweeping divisions operating on a daily basis. The cemeteries play host to the dead from many faiths:- Jews, Muslims, Christians, and are all beautifully maintained. This we found surprising as we had only expected the war graves to be so well tended. We both were wondering what these cities/ places must have been like in 1892.